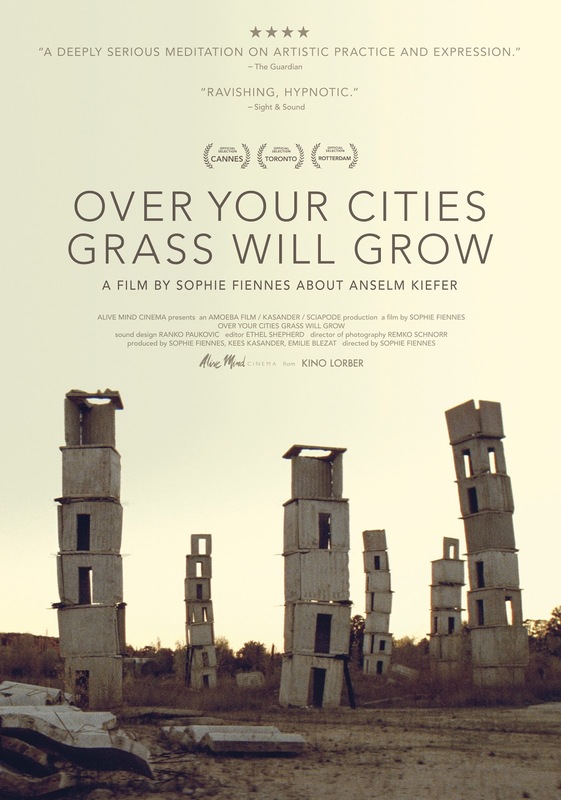 If there was an award for most unintentionally literal abstract title of the year, Sophie Fiennes' new documentary, Over Your Cities Grass Will Grow, would take it in a walk. While the title may symbolically refer to the post-apocalyptic nature of its subject's art, it also serves as a rather ironic reminder that watching this film may feel a bit like watching grass grow. I've always found "boring" to be a lazy criticism, but it's possibly the film's most critical sin. There are undeniably moments of great beauty and even awe here, but it's strung together in such a seemingly arbitrary, stream of consciousness style that it never picks up any kind of narrative or cognitive power. 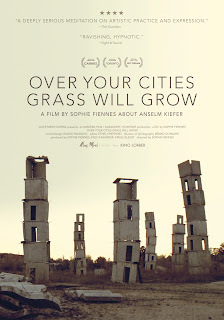 Over Your Cities Grass Will Grow is a strange, modernist appreciation of strange, modernist artist Anselm Kiefer, who in 1993 moved from Buchen, Germany to La Ribaute, an abandoned silk factory in Barjac, France. Anselm Kiefer in Sophie Fiennes' OVER YOUR CITIES GRASS WILL GROW. Courtesy of Kino Lorber, Inc. In 2000, Kiefer began transforming the factory into a sprawling work of architectural art. Using discarded metal and other remnants of human activity, Kiefer creates a man-made labyrinth of twisted steal and broken concrete that resembles some kind of dystopian nightmare. Towers of boxes jut from broken earth, dimly lit tunnels stretch on like ancient mineshafts - everything about Kiefer's work reeks of crumbling modernity. Fiennes' camera plays lovingly over his work, taking long, observant tracking shots through Kiefer's stark landscapes, often accompanied by a droning, industrial, Kubrick-esque score. These forays into the art itself highlight the film. When it comes to showcasing art, the film soars, achieving a kind of transcendental trance state that is completely ethralling. The problem is that Fiennes never places Kiefer's work in any kind of tangible context. While it is clear her goal lies in a more abstract realm of senses and feelings, it is frustrating that the film doggedly refuses to offer any kind of real insight into his art. It offers a fly on the wall look at Kiefer's process, quietly observing his artistic process, but it's all surprisingly mundane. It never feels like watching creation, it feels like watching work. And incredibly slow, dull work at that. A scene from Sophie Fiennes' OVER YOUR CITIES GRASS WILL GROW. The film only allows Kiefer to speak about his art during an extended interview with an art critic that is so statically shot and rambling that it offers no more insight than the seemingly endless passages of wordless observation. It's a strangely inert and lifeless film, an overly self-serious, and dare I say it, pretentious work that never seems to coalesce into a satisfying whole. It takes a legitimate approach - to feel the work rather than explain it, but rather than conjure any sense of wonder, it seems stuck running in place, never quite sure what it wants to be or where it wants to go. Watching an artist at work can be fascinating, but Fiennes seems more interested in showing the most mundane, random details. It all seems so technical rather than fluid, a strange hybrid of the analytical and the lyrical that never really meshes. Fiennes wants to enthrall us, but the film loses its way rather quickly. It meanders and coasts without any real direction, and while Kiefer's work is doubtlessly beautiful and even haunting, Over Your Cities Grass Will Grow is a bland and listless art gallery tour that never quite does it justice. OVER YOUR CITIES GRASS WILL GROW | Directed by Sophie Fiennes | Not rated | In French and German w/English subtitles | Opens today at the Film Forum in NYC.